When working with fonts. in older versions, when you clicked the gear and CHARACTERS in the font table you used to see a character map of the font. Now you see all the characters from all the fonts (I think) with no clear way to see and select the alternative characters. Clicking TYPOGRAPHY will show you some of the Swash characters (sometimes) but I can’t seem to get back to the old view that had a character map of the specific font I am working with. That was so useful! Also, I used to be able to copy a font character in Fontbook and paste it into my file, which I can still do but as soon as I try to change the size using the SIZE column in the font list it switches to a black diamond with a ? in it. I can see there is a swash alternative with the swash to the RIGHT but the only ones it shows as an option in Intaglio are swashes to the LEFT. As usual it is probably something stupid I am missing but it’s making me crazy! Any help? The Text Inspector window that you bring up with Cmd-T or “Show Fonts” is not part of Intaglio: it’s part of macOS itself, so changes in behaviour are down to Apple, not Purgatory Design. Personally, I use PopChar from Ergonis Software https://goo.gl/imWHG, and have done for years. It’s not mega-expensive (€30), but you can download a trial version to see if you like it. Well crap. That didn’t work. Not sure if it is because I am using it in test mode, but none of the swash characters are showing up. 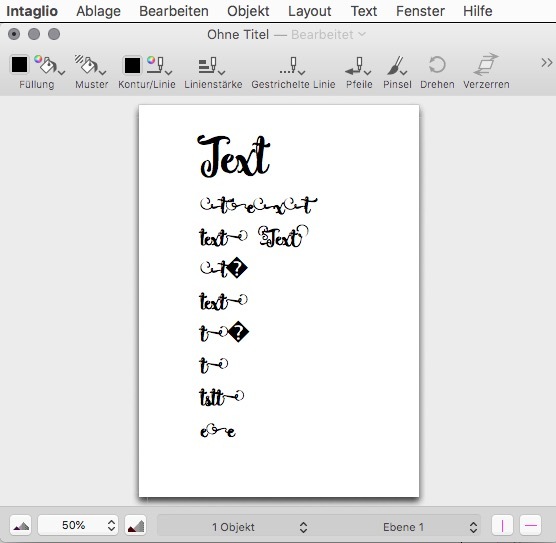 I see them when I look at the font in FontBook but they are not even in the chart in PopChar. Some of the characters are greyed out, but the swash ones just aren’t there at all. It might be the fault of the font but I can SEE the swashes in Fontbook so I know they are there I just can’t seem to access them! Also I thought I read that clicking the character in PopChar would make it appear in your document. I’ve allowed what I need to but that’s not happening either. Just not sure again if it is test mode or me doing something dim. Search the web for “FontBook swash” I found several things that might help. It seems like a cool little tool but nothing I click in it appears in Intaglio. It could be just that font, actually. I had tunnel vision :) I wanted to d a particular thing and PopChar would not cooperate but having tried other fonts some of them DO work with a click->insert. I think I will buy it as Alun is right, it’s not expensive and if it works for many of the fonts, if not all of them, it is still a bit less cumbersome than the workaround. Hi Mary Anne. Can you name at least one font or two which don´t work for you? Well I have no idea what is happening. Now, even the font that I got to work with PopChar is not inserting. NOTHING is inserting since I entered the license key. The font that I initially wanted to use is called Wonder https://creativemarket.com/jrohcreative/184880-Wonder and you can see the swash characters in the sample. I’ve checked and PopChar is allowed In Accessibility but it refuses to insert. I even went back to a font called Sobbers, which inserted before, and that won’t work either - neither clicking to insert nor copy/pasting. I’ve tried restarting Intaglio but nothing. I have to pop out for a few but will shut down the Mac and restart when I return to see if that work.